Size: 27 x 12 x 8.5cm/ 10.63 x 4.72 x 3.35inches(L x W x H). 1 x Single row wall wine glasses shelf with 2Pcs screws. 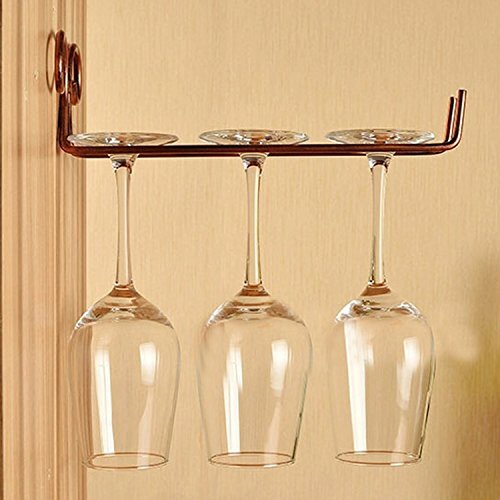 Large capacity: Single row wall goblet shelf hold up to 3Pcs 350ml wine glasses. European Baroque style: Simple but unique design. High quality: Outer plated coating gives you the luxury of texture and has two anti-rust craft. Useful: Not only can be used to do the home decorations, can also be used for bars, coffee houses, etc. Stable: Each contact point to ensure a perfect fit and solid.